Auspice Capital Investors is an asset manager. It’s a team of experienced portfolio managers, led by president Tim Pickering, who work with clients to improve their financial portfolios. Auspice applies rules-based investment strategies across a range of financial and commodity markets. Pickering came to RedPoint because he likes reading our flagship publication, Avenue magazine, and knew we were good at telling stories both accessibly and authoritatively. Auspice’s products tend to perform well even in times of economic downturn, a benefit Pickering was eager to highlight — but first, he needed to get his audience’s attention. To those working in finance, Auspice’s offering is easy to understand. Those less experienced in the investment world, however—including those seeking the services of an expert asset manager—were less versed in “non-correlated liquid alternative investments” and “enhanced beta strategies.” Auspice needed a way to speak to qualified clients in an engaging way. To that end, he and his team came up with five easy-to-comprehend reasons for investing in an Auspice Diversified Program. RedPoint’s challenge was to catch the attention of affluent Avenue readers and convince them to visit the Auspice website and learn more. Out team needed to find an image and copy that would communicate the security and stability Auspice products offer, while introducing Auspice and its “five reasons” in an authoritative but accessible way. 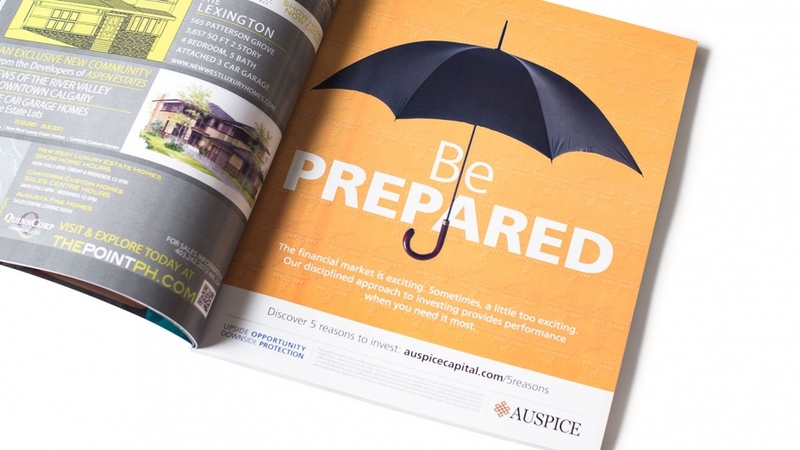 We chose the umbrella to express the concept of security and protection from outside forces, while the copy provides just enough information to communicate Auspice’s services and approach, while remaining enticing enough to encourage its audience to visit the Auspice website and learn Auspice’s five reasons for investing.